The Eldritch Zookeeper is coming to Steam from Matt Luard, creator of The Cat Machine. If you’ve dreamed of running a zoo full of adorable Eldritch creatures that may exhibit strange powers and eat/trample your guests at any time, this title is for you. Check out some of the best simulation games for PC. 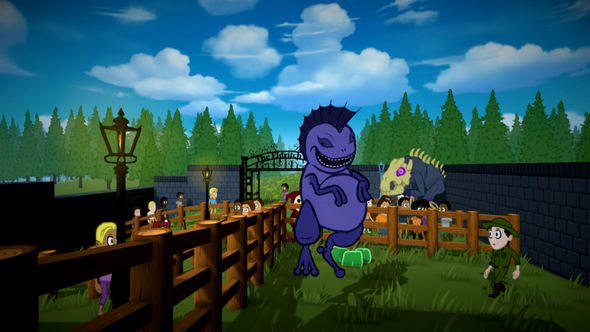 As the titular zookeeper, you’ll have to build enclosures for your supernatural beasties and make sure they’re happy. If they’re not, prepare for fire, chaos, and death as they stomp about your zoo. Each day a tentacle from an extradimensional portal brings you another little hellish cutie to care for. Not only do you have to make sure your little abominable friends rend your flesh from your bones, you also have to keep your park guests happy. What’s a zookeeper to do? You’ll get a chance to play The Eldritch Zookeeper soon on Steam.